Old Man Winter, it seems, has a difficult time with goodbyes. Cold temperatures in the teens at night and highs in the 20’s and low 30’s (below average for the end of March) were complemented by an inch of snow here in St. Peter on Wednesday. On Tuesday, one day after the spring equinox, this precipitation was still in the liquid form, and eventually amounted to an inch of rain. The cold looks to linger through this weekend until about mid-week next week, at which time we should finally hit the 40-degree mark once again. There’s a chance of snow showers on Tuesday, but other than that we should see more sunny and dry weather through most of next week. Speaking of dry weather, it is much appreciated by those living along the Minnesota and Mississippi Rivers right now. Moderate flooding is already occurring in most areas in these rivers’ floodplains, and here in St. Peter we’re approaching a crest at major flood stage around the beginning of next week. So far all of the roads leading out and into St. Peter have remained open; however there is some damage on Hwy. 22 south of town that requires a detour, and one of the northbound lanes of Hwy. 169 north of town has been closed as well. 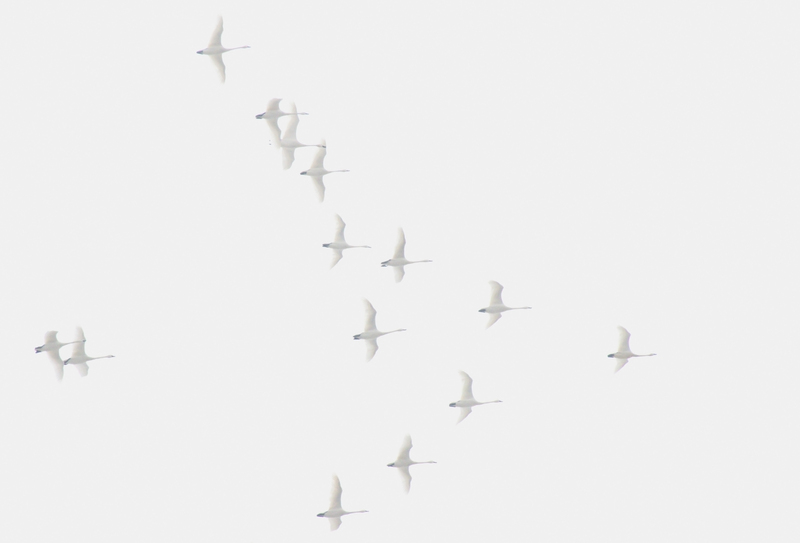 Tundra Swans migrating high above Arb, 3/21/11.